I joined my friends Christian Karasiewicz and Phil Geryshak on their show Social Chatter yesterday, where we had a great time discussing the latest news in the social media world. Facebook now allows you to add music: so far Facebook hasn’t done a good job of integrating music, but they are starting to bring that into your stories, onto your page and potentially into even more features in the future. 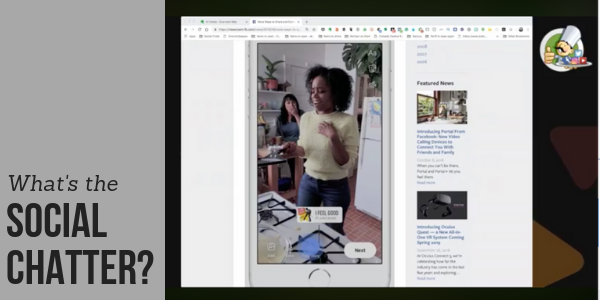 You can now pick a song to share in Stories to further customize them. They’ve also opened up the Lip Sync Live feature to Facebook Pages so that you can interact even more with your fans. Who’s ready for a Lip Sync Contest?! And soon, you will be able to feature songs on your Facebook profile (just like our old MySpace days). Twitter is going to test removing the Like button: The problem they see with the like button is that too many users are just “liking” content without actually engaging with each other. The goal with removing the button is to foster more discussion and cut down on automation and trolling. What do you think about getting rid of the like button on Twitter? Do you think it will help encourage discussion? Are you even active on Twitter? 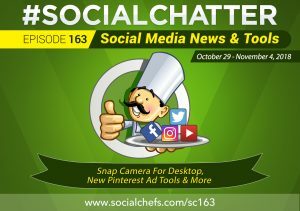 Listen to our full chat here, where we go more in depth on the above topics, as well as the new Snap Camera, Pinterest ads, and some new Tools you can use. 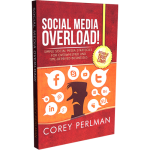 When it comes to social media, pick a few things and double down. Be wary of the shiny new thing. Be willing to test it out (and fail). See what is best for your audience.